Am dritten Maiwochenende erfreut uns die argentinisch-britische Trainerkombination bereits zum sechsten (!) Mal mit einem Workshop voller Energie und Leidenschaft. Die Technik kommt natürlich auch nicht zu kurz. Achtung: Erfahrungsgemäß gehen die Plätze weg wie warme Franzbrötchen! Maxi and Agus started dancing serveral years ago sharing the same body language and their enormous passion for jazz and dance. Both trained in different disciplines and dance a Lindy Hop characterized by smooth connection, sensitivity and fluidity. At the same time they deeply identify with authentic music and vernacular movement though as artists of improvisation they fuse and mix in all kind of styles into their swing dancing. The teaching of Agus is passionate and dedicated to innovation and research aiming to develop a dance accessible to everyone. Alongside Maxi, they work as performers and teachers, holding classes, workshops and seminaries in Buenos Aires, Argentina and abroad. With a degree in Sports Therapy, Charlotte has an understanding of how the body works whilst dancing. Dancing for as long as she can remember, she has a background in contemporary dance, Tap, Jive, 20’s Charleston with a natural flair for Authentic Jazz. Of course, Charlotte’s main passion is Lindy Hop, with a real fun teaching style where every follower who experiences her classes loves her unique focus on followers technique, styling and her mass of follower variations. 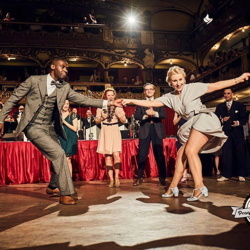 Joseph, known for his exciting and inspirational classes, is currently one of the UK’s leading swing dance teachers, choreographers, performers and avid social dancers of authentic swing dances. Teaching since 1996, his main focus is the Lindy Hop, Blues, 1920’s Charleston, Cake Walk, Snake Hips and Authentic Jazz touring all over the UK and Europe, offering musicality and styling for leaders and followers. Du tanzt seit mindestens 1,5 Jahren mit regelmäßigem Unterricht ebenso wie auf Swing-Parties. Du beherrscht Swingout, Charleston und Sixcount als Grundschritt und kennst schon einige Variationen dieser Grundschritte. Du tanzt seit mindestens 2,5 Jahren mit regelmäßigem Unterricht und hast schon an einigen internationalen Workshops teilgenommen. Du bist in der Lage, Dich im Social Dance auf Deine/n Partner/in und auf die Musik einzustellen. Als Leader erkennst Du Variationen und Highjacks des Followers und bist in der Lage, auf diese zu reagieren – und als Follower hast Du Spaß daran, den Leader mit Deinen Variationen zu überraschen und herauszufordern. Du kennst schon viele Variationen, komplizierte Moves schrecken Dich nicht und Du freust Dich, wenn Du an Deinen Basics arbeiten kannst.